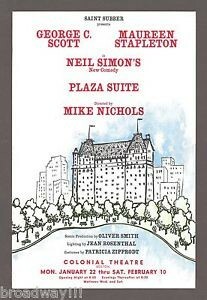 Neil Simon’s play Plaza Suite ran for over a thousand performances on Broadway. 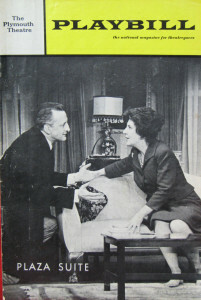 It opened at the Plymouth Theatre in February 1968, and the original cast included Maureen Stapleton, George C. Scott and Bob Balaban. 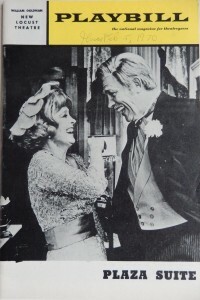 Other stars who appeared as replacements during the show’s 2 1/2+ year Broadway run included Dan Dailey, E. G. Marshall, Don Porter, Nicol Williamson, Barbara Baxley, and Peggy Cass. 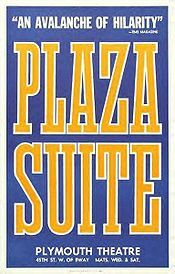 The Broadway production of Plaza Suite closed after 1,097 performances on October 3, 1970. Mike Nichols won the Tony Award for Best Director of a Play. Plaza Suite was nominated for Best Play and Maureen Stapleton was nominated for Best Actress in a Leading Role. 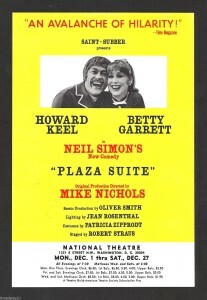 Having been a smasheroo on Broadway, Plaza Suite became a huge hit on tour and a staple in regional and stock theatre throughout the 1970s, accommodating such stars as MGM’s Howard Keel and Betty Garrett, Paul Lynde, Forrest Tucker, Barry Nelson and Dorothy Loudon. A film adaptation of Plaza Suite was inevitable. 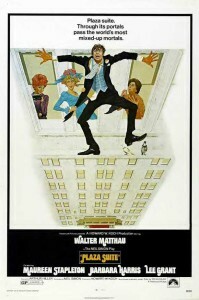 Sporting the tagline “Through its portals pass the world’s most mixed-up mortals” and shot partially on location in New York, the Paramount film starred Walter Matthau, Maureen Stapleton, Barbara Harris, and Lee Grant. Simon wrote the screenplay (he was ultimately dissatisfied with the final film) and Arthur Hiller directed. Maurice Jarre composed the jazzy musical score. 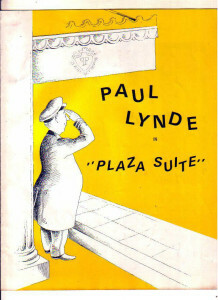 There have been two television adaptations of Plaza Suite to date. In 1982, a filmed version of a live onstage performance starring Jerry Orbach and Lee Grant was aired on HBO OnStage. 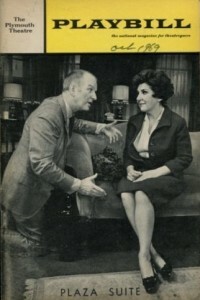 In 1987, Carol Burnett starred in a television production with Dabney Coleman, Hal Holbrook, and Richard Crenna. 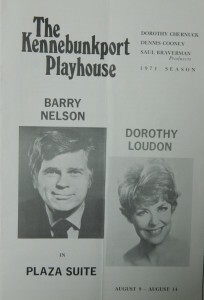 Burnett had performed the show onstage opposite George Kennedy at the Huntington Hartford Theatre in 1971. 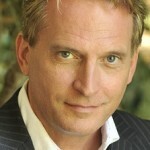 Plaza Suite is produced by special arrangement with Samuel French, Inc.
Rex Smith – A veteran of stage and screen, Rex started his career as a “teen idol” heartthrob with the platinum album hit “You Take My Breath Away.” Turning to Broadway at the height of his popularity, Rex made his Broadway debut as Danny Zuko in the original production of Grease. He received the Theater World Award for his memorable portrayal of Frederic in The Pirates of Penzance on Broadway with Kevin Kline and Linda Ronstadt. Other starring roles onstage include Grand Hotel, Sunset Boulevard (opposite Diahann Carroll), The Scarlet Pimpernel, Annie Get Your Gun, and Kiss Me Kate. On television, Rex hosted Solid Gold, starred in the series Street Hawk, and became a household name on the popular CBS daytime drama As The World Turns. Rex has guest starred on numerous prime time television and movies including JAG, Baywatch, and Caroline In The City. 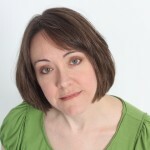 Kelly Hackett – Kelly Hackett delights in making her Judson Theatre Company debut. Favorite roles include the Baker’s Wife in Into the Woods, Nancy in Oliver, Anna in The King and I, and Audrey in Little Shop of Horrors. Kelly also enjoyed performing South Pacific; she played Nellie opposite Tom Wopat as Emile. Love to family and friends, both old and new! 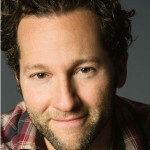 Loren Bidner – Arriving from New York, Loren is excited to be making his North Carolina Theatre debut with the Judson Theatre company. Loren was last seen as Adam in Neil Labute’s Shape of Things at the Riverside Arts Center in Southern California. New York Credits include Signature Theatre, New York Theatre Workshop and countless Fringe festival shows. Regional highlights include Moises Kaufman’s Lady Windermere’s Fan at the WIlliamstown Theatre Festival and The Open Road at The Actors Theatre of Louisville Humana Festival. 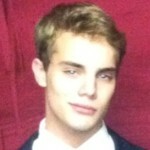 Patrick Holt (Waiter) was most recently onstage at Temple Theatre in Hairspray, Oklahoma! and Cats. He is proud to be part of this dedicated and talented cast and crew. 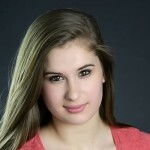 Lani Skelley (u/s Jean, Mimsey) is a Sophomore Acting Major and Musical Theatre Minor at The University of the Arts where she was most recently seen in Ends in Riot. Lani is a graduate of Union Pines. Some favorite credits include Still Life with Iris (NCTC Excellence in Acting), The Drowsy Chaperone, The K of D (NCTC Excellence in Acting), And Then They Came for Me, and Bye Bye Birdie. Much thanks to Morgan for taking me under your wing!